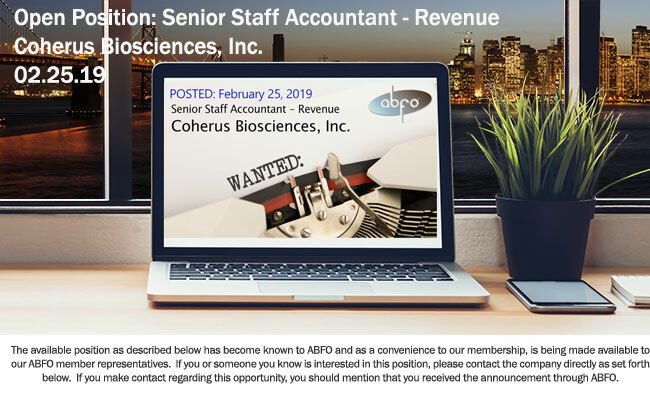 New ABFO Open Job Posting-Senior Staff Accountant - Coherus Biosciences, Inc.
Coherus BioSciences, Inc. (“the Company”) received U.S. Food and Drug Administration approval for its first product, UDENYCA™ (pegfilgrastim-cbqv), the first pegfilgrastim biosimilar approved by both the FDA and the European Commission for patients with cancer receiving myelosuppressive chemotherapy. As such, the Company’s finance department is growing to support the revenue, inventory and other commercial-related accounting for UDENYCA™. The Senior Staff Accountant is responsible for order to cash cycle, processing revenue-related journal entries, providing support to the gross-to-net (GTN) accounting & reporting function, and ensuring to follow generally accepted accounting principles and internal control procedures. The position requires attention to detail due to the high visibility and sensitivity of the revenue function. The role requires strong working relationship with commercial department, FP&A, and outside vendors (e.g. third party logistic, government pricing and claim processing). Revenue accounting experience is desirable but not a requirement. Responsible for preparing revenue related journal entries (sales, chargebacks, bad-debt write off, cash receipts, reserve movements, adjustments, true ups etc. ), and ensuring proper revenue recognition and sales cut-off is achieved. Perform validation ensuring data that is received from third-parties vendors are accurate and complete before gross-to-net (GTN) computation. Interact proactively with revenue-related vendors and Coherus’s internal functional areas to ensure appropriate order-to-cash (OTC) process and revenue accounting. Perform balance sheet reconciliations and analysis for GTN accounts. Monitor prepayments and prepare accruals for commercial organization. Resolve OTC and revenue accounting related issues and disputes or escalate as required. Help drive operational excellence with full alignment from all Coherus business, compliance and audit requirements. Prepare internal and external auditor’s requests to ensure timely and efficient quarterly reviews and annual audit execution; and assist in resolving any issues encountered during the review/audit process. Ensure compliance with SOX policies and procedures. Perform special ad hoc projects as directed by management. Assist in identifying and implementing process improvements to streamline accounting processes. Minimum of 5 years’ experience in accounting. Ability to manage and prioritize various responsibilities with competing, short deadlines. Experience in revenue accounting (preferred).